Slow mornings are always the best for making something special for breakfast. A few weeks ago, on one of these types of slow mornings, we had a craving for poptarts. Not the gross, sugary, refined flour poptarts, topped off with bright pink icing glaze though. 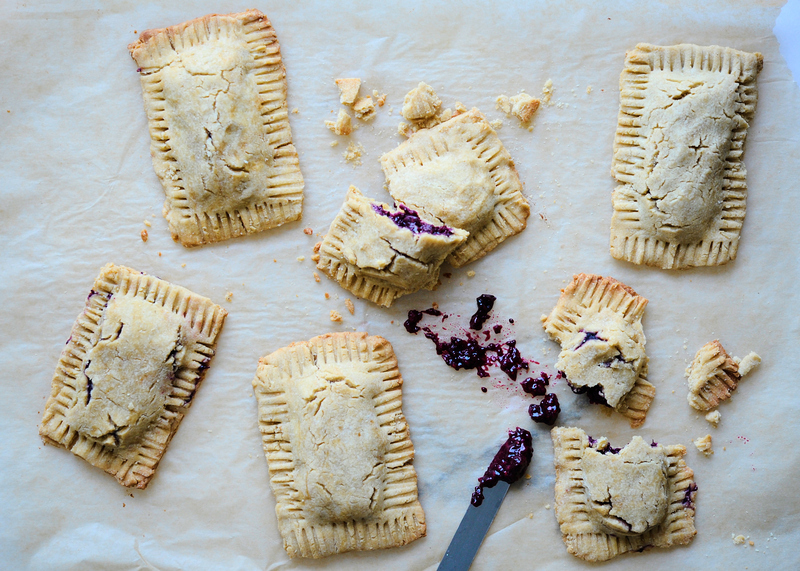 But, for some reason the thought of homemade flaky poptarts, filled with real fruit just sounded so good. So, after some trial and error, we came up with this recipe. It is gluten free and can also be made completely vegan as well (instead of using real butter, just substitute in a healthy vegan butter). Working with this crust can be a little tricky sometimes. You want it to be chilled just enough so that it sticks together, but not too cold that it’s not malleable. Another variation that you could do is substitute in spelt flour if you can eat other grains and aren’t avoiding gluten. Spelt flour would definitely be easier to work with and would ensure the dough rolls out nicely. The best part about this recipe is that the filling is made with real fruit. And, you don’t even need to sweeten it. We use chia seeds to create a “jam” and this provides soluble fiber in an easy to eat treat. This recipe is especially good for kids, as they won’t even know the fibrous chia seeds are mixed in with the berries. Combine the flour, sea salt and coconut sugar in the food processor. Add in the coconut oil and butter, pulsing in the food processor to cut into the dry ingredients. Pulse until a crumbly mixture is formed. Add in the apple sauce and pulse until dough forms. You might need to add a spoonful or two of cold water, if the dough is too dry. You’ll know that it’s working when the dough turns into a ball. Form dough in a ball and wrap with plastic wrap. Put in fridge for 30 minutes. Meanwhile, prepare the jam! See directions below. Then place the ball between two sheets of parchment paper and roll out dough into ¼ inch thickness sheet. Cut out equal sized rectangular pieces for the poptarts to make 12 rectangles. Then place 6 of the rectangles on a parchment lined baking sheet. Place 2 to 3 tsp of jam in the center of each rectangle. Place a dough rectangle on top of each one and then seal the edges with a fork, pressing down to leave indents from the fork prongs. Place the berries in a small pot and heat on low heat. Once they start to heat up, stir and mush them together. After 5 to 10 minutes the berries will be soft and mushy. Stir in the chia seeds and let side for 10 minutes. The mixture will be thick like jam. If you prefer sweetening the jam, you can stir in maple syrup.